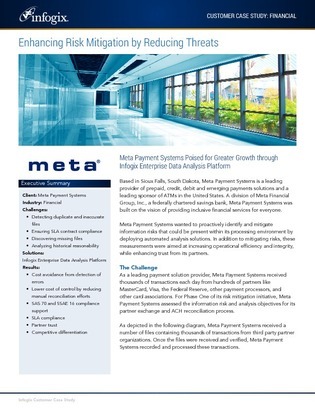 Meta Payment Systems, a leading provider of prepaid, credit, debit and emerging payments solutions, wanted to identify and mitigate information risks proactively within their processing environment by deploying automated analytics. Their goals were to enhance trust, assure data integrity, and improve operational efficiency. This case study explores how Meta Payment Systems met and controlled their objectives with advanced analytics. Find out how they enhanced visibility, generated valuable operational insight, and resolved information risks.